The teaching is not only difficult, it is also controversial and one of the most poorly understood teachings in Buddhism. Many teachers believe it is more important to learn about karma and rebirth, but I would disagree. Most people usually misunderstand these teachings and they end up reinforcing a sense of self. They believe their karma gets attached to the self, and then this self is reborn. So, personally, I believe, if you want to reduce your suffering in this life, you should understand the teaching of non-self. This sense of being a permanent, solid, autonomous self is an illusion. The problem is this illusion doesn’t fit in with our ordinary experience. We have a sense of a permanent, individual self, but that is all it is, a sense, a feeling. If I ask you, ‘Who are you?’ you may tell me about your job – I’m a lawyer, doctor, teacher and so on. But this is not who you are, this is your work. If you changed your job, would you stop being you? So, you are most defiantly not your job. You may tell me about your family or nationality – I’m from a wealthy, middle-class, poor family. I’m Indian, British, African and so on. Again, that is not who you are, it is just you in relation to others. You may tell me you’re a Hindu, Muslim, Christian, etc. But that is your religion and not who you are. You may say you are your thoughts or feelings or emotions, but these are all impermanent, so they cannot be you. The same goes for your body or your experiences, they are also impermanent and cannot be you. We can go on with this exercise forever, but everything we find will be impermanent and superficial. There really is nothing within ourselves that is independent and never changing. So, if you are thinking here that Buddhism is saying you don’t exist, it isn’t. What it’s saying is, you do not exist in the way you think you do. We are not permanent, individual, solid entities. Instead, we are changing moment to moment, like the water flowing down a mountain stream. Giving ourselves a fixed name or identity doesn’t make us permanent, it is just a convention we have come up with so we can talk about ourselves. If you took me apart and laid all of my bits and pieces on the floor, you would not find an inherently existing Yeshe. So, a question everyone asks when they come across this teaching is, ‘If I am not who I think I am, who am I? Instead of a permanent self or soul the individual is compounded of five factors that are constantly changing (See How we experience the world). These collection of five changing processes, known as the five aggregates, are: the processes of the physical body, of feelings, of perceptions, of responses and of the flow of consciousness that experiences them all. When we identify with the process of the physical body, we get attached to our physical form. When we identify with the process of our feelings, our perceptions and our responses, we become attached to them. Our sense of self arises whenever we grasp at, or identify with, these patterns. The sense of a self is perpetuated because we pay attention to only the surface of our experiences. We never take the time to delve deeper. We identify with what we like and don’t like, what we want and don’t want, our dreams and beliefs. We think our thoughts, feelings, emotions and physical sensations are a part of us, instead of seeing them as passing phenomena. If we allow ourselves time to observe these processes come and go, we would be able to see them as just experiences that arise and fall away, and not a self. If we had a permanent self we would never be able to change. So, if we want to grow and change, we need to let go of this idea that we have a self that defines us. The next question people ask when they hear about non-self is, ‘So what? Why should I care if I have a self or not?’ This idea of a self produces harmful thoughts of ‘me’ and ‘mine’, selfish desire, craving, attachment, hatred, ill-will, conceit, pride, egoism and other defilements, impurities and problems. In fact, in Buddhism, it is said that the illusion of a self is the source of all our suffering. When we identify with our physical, emotional and mental experiences we become attached to them; the threat of losing any of these is deemed a threat to our very existence. But we are going to lose them because they are impermanent. This means the illusion of a self is setting ourselves up for failure. When we observe the rising and falling away of all phenomena we see that everything arises from nothing and then goes back to nothing. This includes our thoughts, feelings, emotions and physical sensations. If we examine our experiences in this way, we begin to see that our thoughts, feelings, emotions and sensations are not a self. 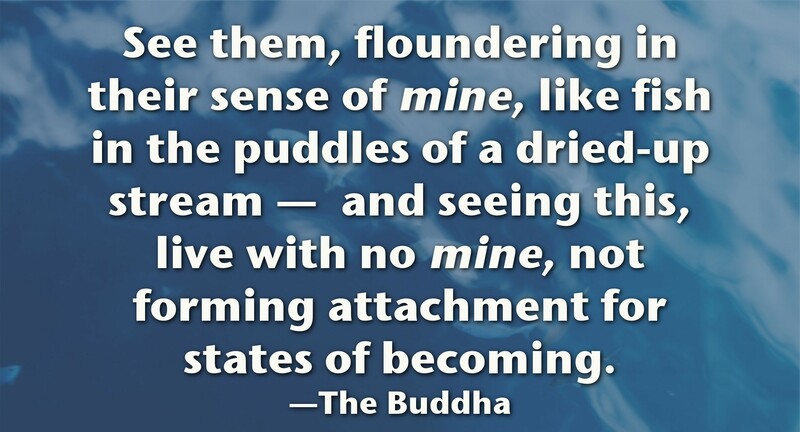 This allows us to let go of our attachment to them. This in turn releases us from our suffering. So, you may still be thinking, ‘if this teaching of non-self is true, then who’s reading this? I would answer, a growing, changing being that is in constant flux, and not a solid, permanent, individual self or soul. Where does emptiness and the Mahayana view of the five aggregates fit in? As an ordained Tibetan Lama, do you think there is a benefit to the Mahayana view over the thervada view of the five aggregates? The five aggregates come into being through causes and conditions. They are also impermanent. So, this means they are empty of any inherent nature of their own. The five aggregates, as well as anything else are empty of any true nature. I do not believe there is a substantial difference between the Mahayana and Theravada view on the aggregates. In the Theravada tradition, suffering arises when you clings to the aggregates. This suffering stops when you cease getting attached to the aggregates. The Mahayana tradition asserts that the nature of all aggregates is empty of independent existence. Understanding this point will stop any suffering caused by misunderstanding the aggregates. Either way, your suffering is reduced. I have read this article quite a few times now and it does start to make a little more sense each time I read it. How should I meditate or reflect on this topic to help me make more sense of it? I suggest you meditate on the impermanence of your body, thoughts, feelings, emotions and experiences (the five aggregates). This will show you that there is nothing permanent we can call a self.